Brazil's President Dilma Rousseff has said she could ask the South American trade bloc Mercosur to suspend the country if she is removed from office. "I would appeal to the democracy clause if there were, from now on, a rupture of what I consider democratic process," she told reporters in New York. Earlier this week, the lower house of Brazil's Congress comfortably approved to start impeachment proceedings against her. She is accused of juggling accounts to make her government's economic performance appear better than it was, ahead of her election campaign. 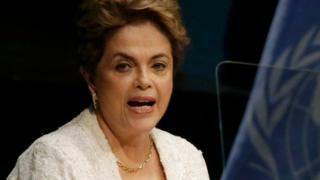 The president has defended her government's fiscal manoeuvres as common practice in Brazil. Earlier, in a speech to the UN during the signing of the Paris Agreement on climate change, Ms Rousseff had a softer tone, in which she avoided the word "coup." "I cannot conclude my remarks without mentioning the grave moment Brazil is currently undergoing," she said. "I have no doubt our people will be capable of preventing any setbacks." Ms Rousseff has accused him of being one of the ringleaders of the "coup" attempt against her. In an interview to the New York Times, Mr Temer said: "I'm very worried about the president's intention to say that Brazil is some minor republic where coups are carried out." Senate vote on trial: A simple majority is enough to suspend her for up to 180 days while she is put on trial. Vice-President Michel Temer would step in during this period.